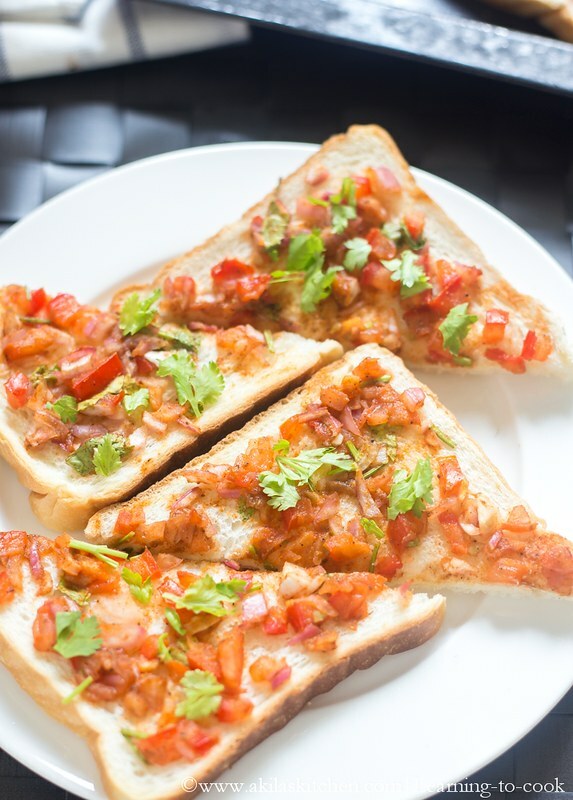 Tomato Bread Toast is an easy and spicy toast to have for a lazy day without any jiffy. When I was searching in net I found many tomato bread recipes in western versions. Could not find much in Indian style. So thought why can’t we prepare our own indianised version for the tomato toast and this recipe is born. Everyone in our family loved this very much. 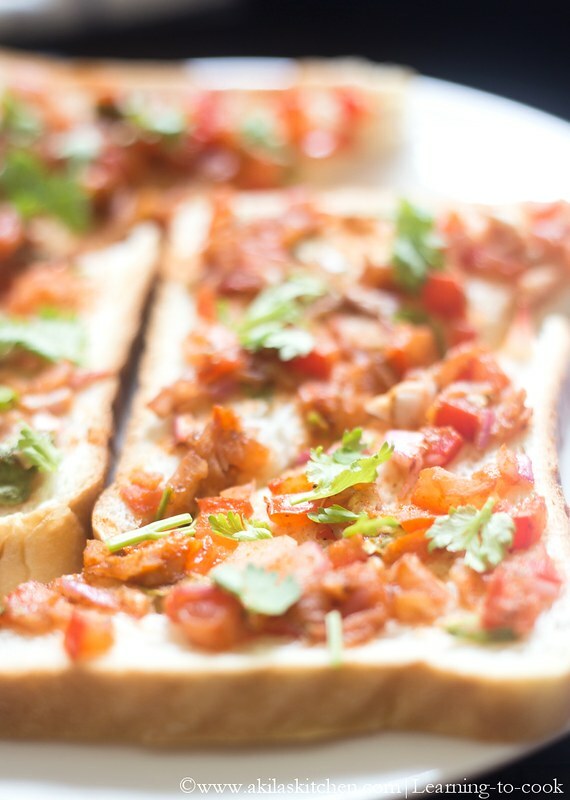 In morning hurry burry this tomato bread toast is easy to make and much more satisfying. 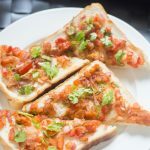 So, Do try in your house this Tomato Bread toast Indian Style and let me know how it came for you. You can check my other bread toast recipes here. Some I have given below. 1. Add all the ingredients except bread in a bowl. Mix them well. 2. Sprinkle little olive oil on bread and spread the prepared mixture. Toast it in convection oven at 170 deg celcious for 6 to 8 minutes or until the edges of bread becomes crispy. 3. Remove from the oven and serve it hot. 1. If you like adding more onions you can add. 2. Also instead of tomato sauce, you can add tomato chilli sauce. 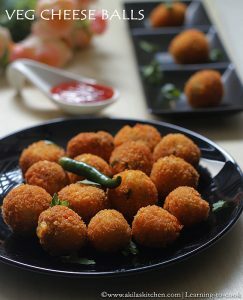 But it will be more spicy n sweeter version. 3. You can reduce the garam masala when preparing for children. 4. You can also sprinkle chat masala just before serving. 5. My small one strictly said not to add the green chilli, so I did not add. Chilli powder and garam masala itself gives enough spiciness for our dish. If you want more spicy, you can add green chilli. Tomato Bread Toast is an easy and spicy toast to have for a lazy day without any jiffy. Add all the ingredients except bread in a bowl. Mix them well. Sprinkle little olive oil on bread and spread the prepared mixture. Toast it in convection oven at 170 deg celcious for 6 to 8 minutes or until the edges of bread becomes crispy. Remove from the oven and serve it hot. 1. If you like adding more onions you can add. 2. Also instead of tomato sauce, you can add tomato chilli sauce. But it will be more spicy n sweeter version. 3. You can reduce the garam masala when preparing for children. 4. You can also sprinkle chat masala just before serving. 5. My small one strictly said not to add the green chilli, so I did not add. Chilli powder and garam masala itself gives enough spiciness for our dish. If you want more spicy, you can add green chilli. 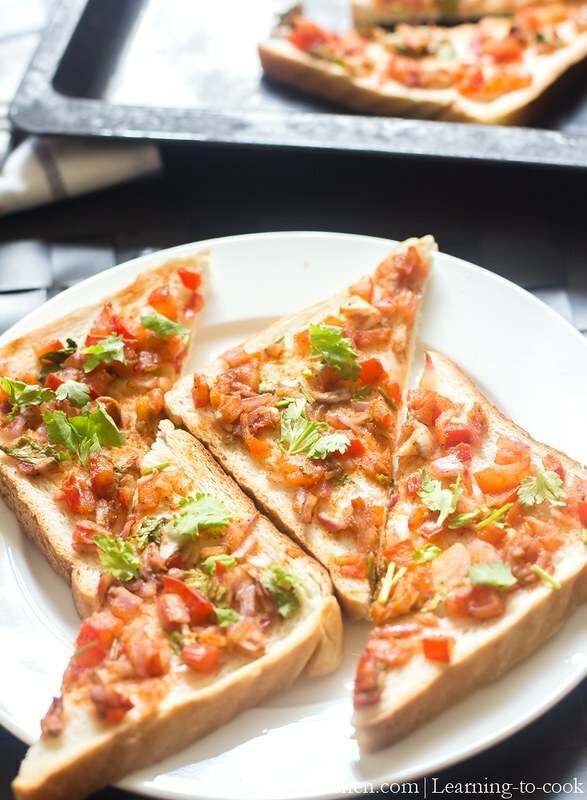 Try this Tomato Bread Toast and enjoy your day!!! What an interesting way to prepare a quick delicious toast. I would love to serve these with some soup. Tomato bread toast looks delicious.